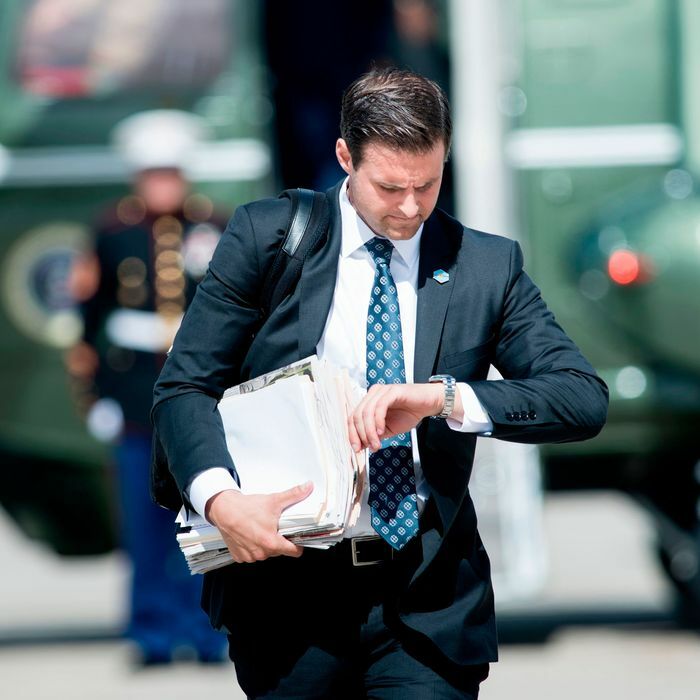 On Monday, the Trump administration fired John McEntee, after a federal investigation uncovered evidence that he had committed “serious financial crimes.” The White House aide was escorted from 1600 Pennsylvania Avenue by security officials, who felt it so urgent to remove the suspected criminal from the presidential abode, they refused to allow McEntee to grab his jacket and belongings before tossing him to the curb. Under a different administration, this development might rank as a baffling, scandalous, front-page story. Under our current one, McEntee’s job change has barely made more of an impression than your average LinkedIn notification — what with the president firing his secretary of State via a tweet, preparing a trade war against China, and steering America ever closer to a military confrontation with a nuclear weapons state. A background in financial crime might disqualify McEntee from working on most presidential campaigns — but judging from precedent, such experience is practically a prerequisite for working on Trump’s.